Season of hot days and mellow sunsets. Close bosom friend of the maturing sun. 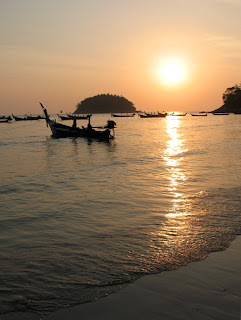 This is a great time of year to be in Phuket. Can't beat this weather, though it has been quite windy recently, which is unusual for February. Mornings are still fresh and clear, nights are cool ("cool" being a relative term... a 25 degree night in England would be called sweltering), the days are getting longer (although we are but 8 degrees from the equator, we do notice the lengthening days), the sun shines and oh! the sunsets! I stopped at Kata beach this evening on the way home. The sunset is around 6:30 at the moment. In November sunset can be as early as 6pm. A longer day is appreciated when it coincides with my journey home. In the summer, I can actually get home in the daylight!